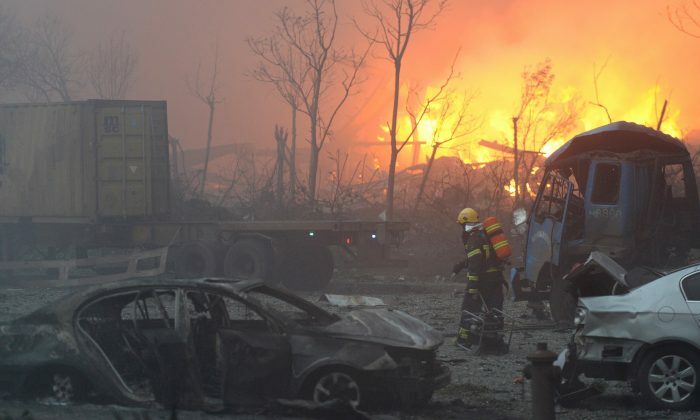 The Red Cross of China is going all out in its rescue efforts, in the wake of two extremely powerful explosions at a storage facility in the port city of Tianjin on China’s eastern coast on Aug. 11. “Just four hours after the explosion” tents, first aid kids, food and water were being delivered to victims, according to an account on the website of the International Federation of the Red Cross, of which China’s Red Cross is a member. The eager work of Red Cross workers to deliver help has been a focus of Chinese news reports for the last two days. You donate tens of billions overseas; you put on the Olympics; how is it that when it comes to your own people you look to the masses to donate money themselves? At least 50 people are thought to have died, according to official reports, while hundreds have been injured. And yet Chinese Internet users are not only not grateful and eager to donate to the Red Cross’s, but are instead furious. According to a review of hundreds of comments made in response to an appeal by the Red Cross, posted to the Sina Weibo account of People’s Daily, the mouthpiece of the Chinese Communist Party, at least 90 percent of the sentiment is negative. The most single common response is the Chinese term “gun” (pronounced gwun), which, depending on the context, could mean anything from “get lost” to a much less gentile imperative. Others say: “Donate your little sister,” a phrase that, in this context, has a vulgar meaning. “You donate tens of billions overseas; you put on the Olympics; how is it that when it comes to your own people you look to the masses to donate money themselves?” wrote J_Lisha. Others drew attention to the Guo Meimei scandal of 2011, where a young prima donna photographed herself in front of luxury vehicles and declared that she held a title with the Red Cross of China. The incident crystallized for the public the idea that the Red Cross Society of China was not a neutral, apolitical health care organization as may be found in other countries, but another opportunity for corrupt official to enrich themselves. The fact that Guo Meimei did not, in the end, appear to hold a formal title with the Red Cross did little to dampen these perceptions. The public’s problem with the Red Cross is largely due to the fact that it is controlled heavily and almost exclusively by the Communist Party itself, with little external oversight. Recently, the deputy director of the Red Cross in Sichuan Province was found to have embezzled 7.5 million yuan ($1.1 million) in bribes over the years. Prior to that, she was the deputy head of the health and family commission in Sichuan—the agency that implements the Communist Party’s one-child policy, which includes forced abortions. Local officials have taken advantage of the Yunnan earthquake to enrich themselves. Guo Meimei, WHY?!?!? I’m sorry, I’m a wreck today. And it’s all because of Guo Meimei. Beautiful tyrant, fiend angelical, dove-feathered raven, wolvish ravening lamb! The Chinese Red Cross rent out China's largest disaster preparedness website, turning the state-funded facility into a source of profit.